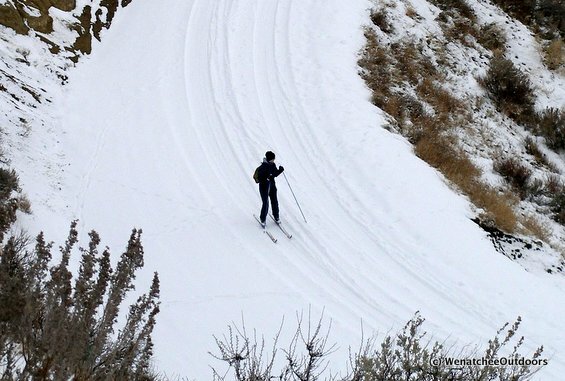 Matt Dahlgreen sent us this information about cross-country skiing Rattlesnake Springs Road (out of Swakane Canyon) on January 6, 2013. 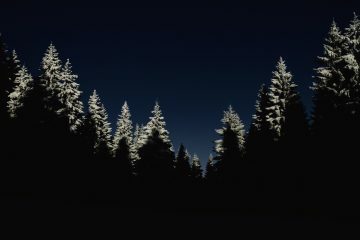 My wife and I cross-country skied up the Rattlesnake Springs Road leaving from Swakane Canyon. Right after a snowfall is a good time to ski here before warmer temperatures or sun affect the snow on the road. The road has a southern exposure, and won’t hold snow long once the sun returns. 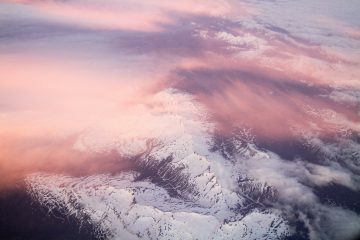 This route can only be skied in years with plenty of snow, so savor the rare opportunity when it arises. Maps. See our topo map below. Note: Use ‘Print Preview’ to orient/scale the map before printing. Distance: (round-trip): About 5.5 miles from Swakane Canyon Rd. to the unnamed peak, and 7.3 miles from Swakane Canyon Rd. to Rattlesnake Springs. Elevation Gain: About 2900 feet from the parking area to the unnamed peak. Best Seasons. Winter, if snow is deep enough. Access. From Wenatchee, follow 97A north toward Rocky Reach Dam. One mile north of the dam, turn left on Swakane Canyon Rd (FS Rd. 7415). In about 2.8 miles the gated Rattlesnake Springs Rd (FS Rd. 5215) intersects Swakane Canyon Rd. on the right. Park in the space near the old Department of Fish and Wildlife barn. Trip Instructions. Follow the road for as long as time and energy allows. At mile 5.5 miles you reach the main ridge crest and a road splits off to the left. In 0.25 miles the leads to the top of Point 3923. From this junction it is still another 1.8 miles along Road 5215 to Rattlesnake Springs – the journey now that you are high is pretty but the destination itself is rather non distinct and a rather non-spectacular conclusion to a long climb. Uses Allowed. Snowmobiles are allowed, but don’t seem to use this area much. Four-wheelers do use the road but cause less damage than they do on other local primitive roads like Badger Mountain Rd. Hazards. The canyon road is not plowed. Driving up the road is manageable if the snow and ice have been packed down by other drivers, but turning around beyond the parking area can be difficult. Other issues. 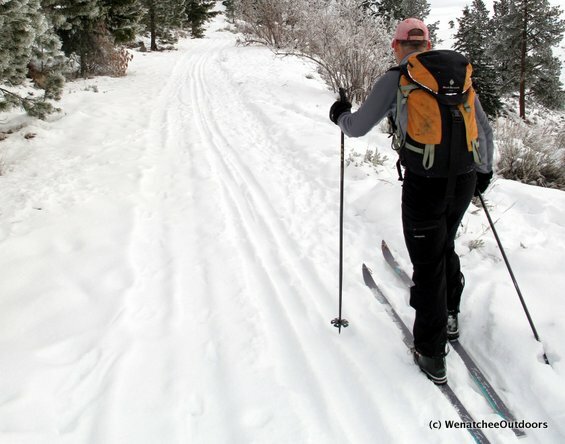 We used skinny skins on metal-edged cross-country skis to go up Rattlesnake Springs Road. The road may be challenging without skins — it’s a very steady uphill grade with a couple of steep pitches. The road isn’t maintained so there are a few larger rocks in it here and there. Land Ownership. US Forest Service. More Info. 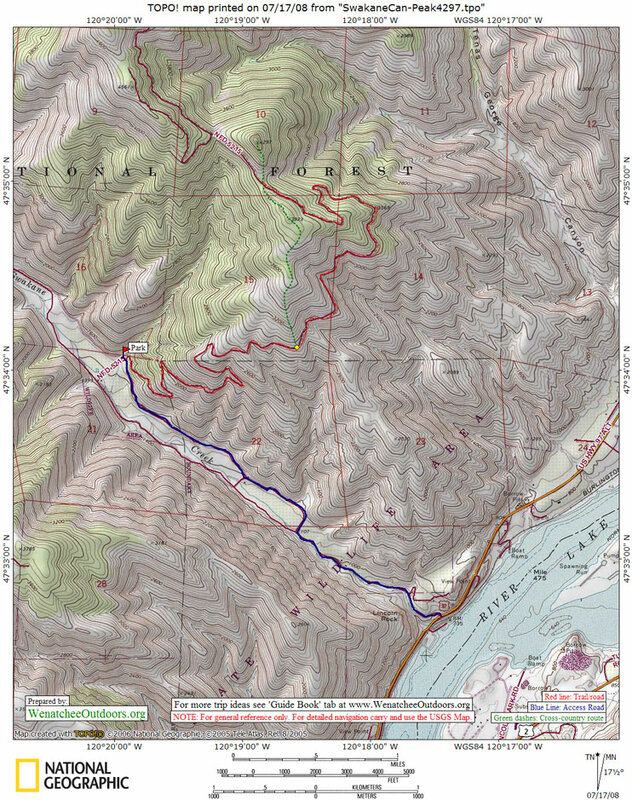 See our information and topographic map for hiking Swakane Canyon sans snow. 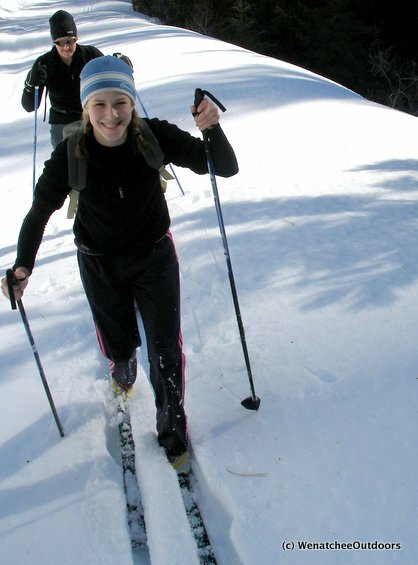 For other regional Nordic skiing options, see our Nordic Skiing Guidebook. Snow conditions. Use our ‘Skiing’ Condition Reports on the homepage of our website to evaluate the snow and avalanche conditions before you head out. Also, check the Snow & Ski User Reports to see what others are reporting about the current backcountry conditions.